A must for protecting costumes! Final Seal is designed to be used two different ways. The first is as an anti-perspirant by applying to clean dry skin prior to makeup application it reduces the effects of sweat on makeup. The second is to seal the finished makeup application and keep the makeup in place creating a smudge-proof finish. 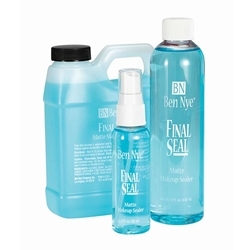 Final seal can also be used to add durability to air-brushed makeup. Final Seal is alcohol based and has a fresh mint scent. It is suggested to use in a well ventilated area. Available in 1 oz. or 2 oz. spray bottles and larger 8 oz. or 16 oz. refills.